Hitches are an underlooked, but vital component of your RV gear. If you purchase the wrong type of hitch for your trailer and tow vehicle, you could risk causing serious damage or an accident while traveling. To help you find the best fit for your camper, we have listed 5 tips you should discuss with your RV dealership or service station when shopping for a hitch. 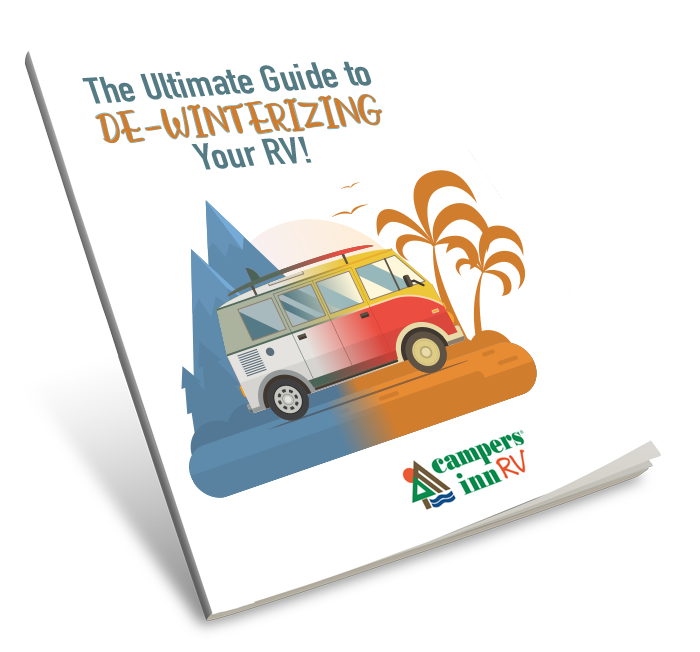 Most marketing brochures list a travel trailer’s Unloaded Vehicle Weight (UVW). This represents the trailer's weight with just the standard equipment after manufacturing. But no one camps with just the standard equipment. Your camper will be packed with all your clothes, toys and accessories, and the water and fuel tanks will be full, as well. Therefore, you need to purchase a hitch that will support the true weight of your trailer. Once you know how much your trailer is really going to weigh, you need to determine your car or truck’s towing capacity. This information can be found in the owners’ manual. If your tow vehicle is not rated for the weight of your trailer, you could cause unnecessary damage to your vehicle or even be involved in a serious accident. If this is the case, you will need to consider purchasing another trailer or another tow vehicle. 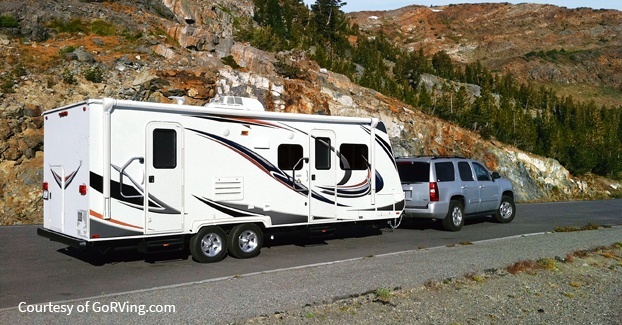 For most travel trailers, a weight distribution hitch is essential for safely towing your RV on the road. This type of hitch balances the weight of the trailer between both it and the tow vehicle in order to prevent sagging at the hitch tongue. 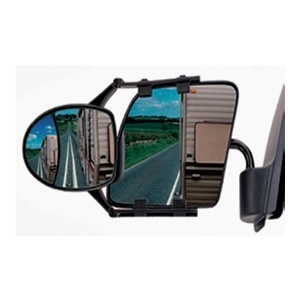 This helps improve your ability to steer, brake and control your trailer when on the move. Likewise, a sway control device will help you keep your trailer straight in the event of high winds, passing trucks or bad weather. 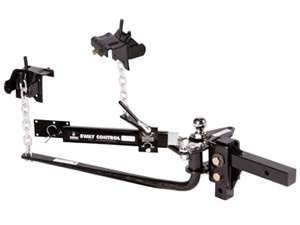 Without sway control, it is possible for your trailer to swing so much you will lose control and even cause an accident. Driving with a travel trailer, pop-up or other tow-behind vehicle takes more skill and attention than just driving a car. Remember, you are pulling a big, heavy house behind you. You’ll need extra time to stop, turn, back-in and maneuver. After you buy your RV, head to an empty parking lot and practice, practice, practice! Once you've got your new trailer hitched up, you'll need to stock up on all the essential supplies for your trip! 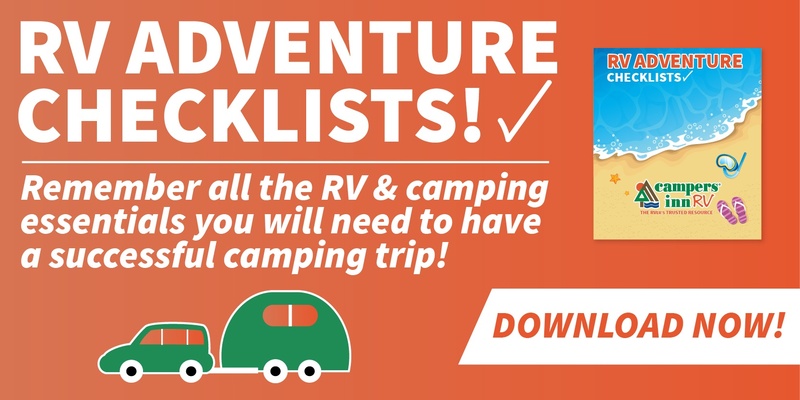 Download our free RV Adventure Checklist to make sure you everything you'll need.